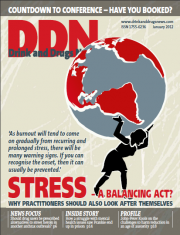 The difficulties of accessing appropriate treatment are acknowledged in NOMS’ recent review of Drug Rehabilitation Requirements (DRRs), as Ros Weetman discusses on page 12. Over the page, Kelly Overton and Frankie Owens illustrate the need for the right treatment at the right time – Kelly as a young mother trying her hardest to kick addiction and Frankie, whose family life and career were jeopardised by a crippling mental health problem, and who didn’t break the cycle of prison and crime until he was sectioned under the Mental Health Act. NOMS’ acknowledgement that service user involvement should help to inform treatment is a welcome step, coupled with support to gain skills and qualifications and clearer referral pathways to essential wraparound services, such as housing and help with tackling debts. If you’re feeling a little stressed as we hurtle into the new year, take a long slow breath, shake your arms and legs, and read our cover story by psychotherapist Ben Gatty (page 8). Taking time to look after yourself might sound like common sense, but how many of us learn to recognise the signs of stress before they threaten to overtake us? For a morale boost and some energising team spirit, join us for our Together we stand conference in Birmingham on 16 February. (See details on our website.) It’ll be a day well spent! A report into the Scottish anthrax outbreak of 2009-10 has recommended ‘further discussion’about prescribing alternatives to street heroin should there be a similar event. DDN reports. Practitioners need to look after themselves as well as the people they care for. Ben Gatty shares tips on dealing with stress, developed for a staff training day at Westminster Drug Project. People who enter services through the criminal justice system should have the same access as anyone else to the right treatment at the right time, says Ros Weetman. Kelly Overton speaks out on behalf of women in prison for drug-related offences. Frankie Owens’ life seemed destined to revolve around the criminal justice system until he finally got the right treatment in prison for his mental health problems. He tells his story. Harm Reduction International chair John-Peter Kools has been at the forefront of harm reduction work for almost 30 years, operating across Europe and beyond. He talks to David Gilliver.